Under the assumption that you match a dictionary definition of “beginner”, thus lacking any practical knowledge of the basic rules of poker and its many variations, we start in the most patronizing manner imaginable – by explaining what exactly Let It Ride is (or, in this case, Let ‘em Ride, as catalogued in Bovada.lv casino). Based on the 5-card stud poker variation, Let It Ride is a slow-paced game with 3 cards dealt for the player and 2 community cards placed on the table, face down. What makes the game particularly appealing to poker neophytes and more skittish players is the type of insurance that Let It Ride offers, enabling the participants to potentially save a portion of their bet (which, truth be told, goes against every gambling fibre, as good as it may sound). The players will have their first chance to take the high road after the initial card is dealt while the second opportunity for the preliminary damage control comes once the community card is drawn – those who are faint of heart can reduce their betting amount on either of the two occasions or simply go with the flow and let it ride (hence the name)! Now that you have the gist of it, you can put your knowledge to practice and try your luck with Let ‘em Ride in Bovada, which just happens to be one of the casinos where the game is available in real cash and all its glorious, mobile compatible simplicity. And, it would have to be underlined that the simplicity is the operative word, at least when this particular platform is concerned. In terms of layout, the developer has really done an outstanding job of providing the optimal and responsive software that puts the players at ease, regardless of their skill levels and the knowledge of the basic poker strategy. One of the main advantages of Let ‘em Ride Bovada table is the clean-cut layout which does not overwhelm the player; instead, the user can cut right to the chase, even with the loose understanding of the betting process – the beauty of Bovada Let ‘em Ride is that you can pretty much pick up things along the way and start betting like a pro in no more than a couple of minutes. And, if you are not that confident, you will be comforted by the fact that the detailed game description is provided, and one can refer to it during the session, without interrupting the game flow. The first step is placing the Ante bet which needs to be within the pre-determined table limits – in this case, Bovada casino has set the minimum limit at $1 whereas the maximum bet is $500. 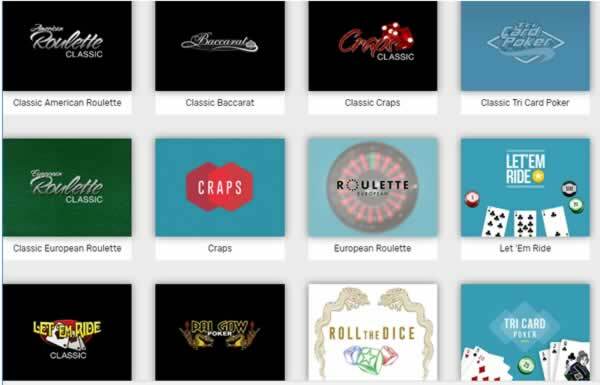 Apart from the standard betting options, Let ‘em Ride comes with an optional Progressive Jackpot – to opt-in, the player will need to place a qualifying $1 bet before each new round and hope that luck will be a lady. Once you part from your first chip, start the session by clicking on the Deal button – this will trigger the first card draw and three cards facing up will be laid out on the table. Although your hand is yet to be combined with the community cards, you will have enough information at this point to decide whether or not it would be a good idea to raise. With just two community cards heading your way, the combinatory value of your hand may not be as great as in a poker version with five community cards – that being said, most players will raise if they have at least a Q+6+4 combination, or a high King/ Ace card. However a more optimal Let it ride strategy can be used easily. After weighing the options, players will now continue with either raising the stakes and adding an extra wager in the same amount as the Ante, or checking, which means that the game will be continued without adding extra funds to your initial bet. Two more cards will be drawn and revealed one at a time, right after the player is once again presented with the option to check or raise. Once that’s out of the way, the second community card is revealed, and the bets are settled according to the highest-ranking hand combination between the player’s first three cards and the community extras. The payouts start with at least a pair of 10s, and anything less will result in a loss of Ante and the follow-up bets. To start a new session, just click on the Rebet button and you are ready for another round of Let ‘em Ride. Obviously, your every decision will be affected by the possible combinations that you can muster with all five cards at the table, which is why a player must know how the hands rank; while the software will calculate the payout amount for you and let you know whether or not you actually won, you will need to get to the finish line alone. Ready to Let it Ride? Simple as it is, Let it Ride can be a lot of fun, especially for the players who are in the early stage of discovering the intricate world of poker strategy – if you are looking into mastering the rules of other variants such as Hold’em, you may want to start your journey at this stop. To get started just visit Bovada and register an account. You can play for free or real money easily. Bovada is our most recommended online casino for USA gamblers.